The Jungle Teacher: What An Eventful Week! I was actually looking forward to an uneventful holiday at my parents' holiday house, lazing on the large cushy couch in the living room, sipping on a glass of Hennessey & puffing on a Cuban cigar while reading the morning news or writing the next Malaysian novel. Such was the extent of relaxation I yearned for due to the taxing & hair-pulling nature of the previous month. Little did I know, my greatly delayed flight was a sign of times for an eventful holiday back at home! The most significant of all events was the government's decision to increase oil prices. It's quite a steep increase for petrol from RM1.90 to RM2.70 per litre. A full tank used to cost RM50, previously it was RM60, now it costs more than RM100. This increase has allowed Malaysia to break the world record of longest time for queues outside petrol stations nationwide! 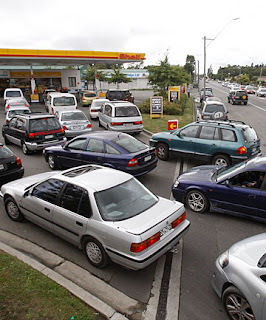 On Wednesday, June 4, petrol stations nationwide were congested for an amazing 8 hours from 4pm to 12pm! There were lines as long as the Rajang River causing congestion of roads as well as an immense waste of petrol and precious time. Seriously, instead of announcing a price increase for tomorrow at 4pm today, I think the government should give the public a few days grace to prepare for the price hike or at least let it be an unexpected unpleasant surprise the next morning. Also watch out for merchants trying to make a dishonest buck & any robberies due to the increase in EVERYTHING. The government has announced plans to cushion the impact of increased fuel prices so let's be conservative with our spending while at the same time hopeful that our government is working for the benefit of everyone in need. The most amazing of all events was the standing of the eggs. Yes, chicken eggs suddenly sprouted invisible magical legs & stood up for a while. It occurs only at 12pm on the 5th day of the 5th month in lunar calendar, which was last Sunday. The 5th day of the 5th month is also the day the Chinese celebrate DuanWu (or Dragon Boat) festival. 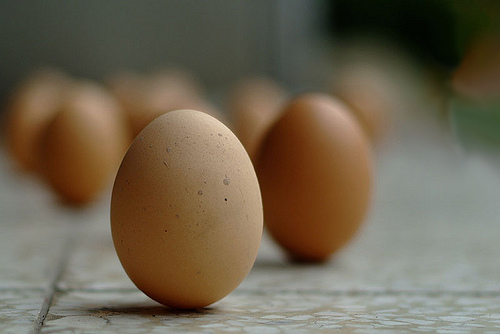 Actually, these eggs were able to stand because gravity is strongest at that time of the year. Another rumour I heard is that sick people will get healed if they jump into a lake at 12pm on that same day. When I do, you can be sure to catch it on my blog! The most time was spent on hanging out with old friends from middle school & high school. 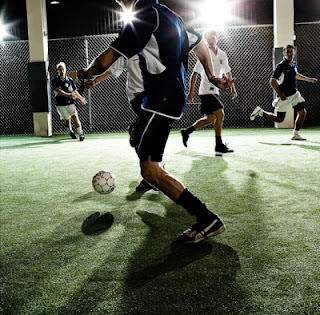 Besides chilling at food & beverage establishments, most of the time spent with them was spent playing futsal. I played futsal an amazing total of 4 times in 7 days. However, I sprained my left ankle badly during my first & latest game. So I'm letting my legs rest during my last week in Kuching to recover for competitive 11-a-side football back at in KL. Thank God I can still walk! Less football means more hangouts next week! Most recent friend was Ivanna Ting of whom I met through her blog. She caught my attention with a compelling poem but has yet to produce more. Come on Ivanna… Stop camwhoring & start writing some meaty stuff! I hung out with her a few times at her part-time workplace in Bormill, Pick & Pack. 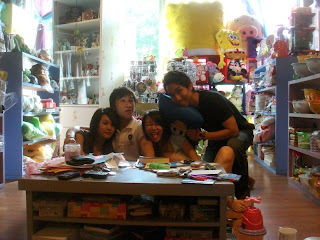 Pick & Pack is a novelty shop on the 2nd floor of one of the newer buildings & is perhaps better known for its display of a massive SpongeBob stuffed doll that will set you back around RM1500. Nothing proves your love to your woman more than a larger than life doll with a larger than life price. Ivanna was carefully etching onto a mug an intricate piece of artwork required from a customer for a father’s day gift. She does it really well & it is almost identical to the model followed. for a price, you can modify any item or you can have something unique made for you! The best food & beverage establishment I have visited so far has got to be Bing!. They serve Illy coffee, free Wi-Fi & a relaxing air-conditioned environment. I did not have internet at home so I'd park myself on one of their large cushy couches & sip on a cup of good latte. And I mean GOOOOOD latte! It's hard to find a place in Malaysia that prepares coffee properly. 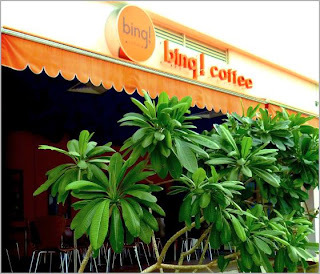 And in Kuching, this local cafe, Bing! I come only at night because the best barista works at night. Illy coffee is one of my favourite Italian coffee bean roasters. I only drink the best coffee. So Illy coffee + night barista of Bing! = satisfied customer koko’! The most disappointing moment was last night. Italy lost in their EURO 2008 game against the Netherlands. And they had to lose so convincingly... 3-0. Both teams started out cautious, testing each other. But when the Dutch started picking up the pace, the Italians were still dragging their feet. Only after losing a second goal did those mozzarella filled chunks awaken from their slumber & started playing like they wanted to win. In the end, the match was won by teamwork & cohesion. This, the Dutch had plenty. Both teams were equally skilled & both worked hard to win. But the Dutch side's edge was their outstanding display of teamwork. 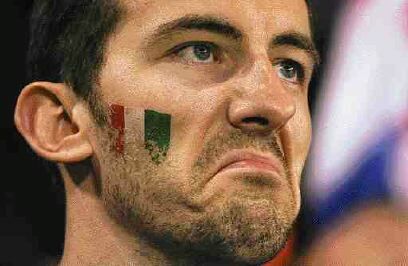 Italy had many chances during the game but they failed to work together. They were constantly losing the ball while attacking because they thought their teammate had run the other way.